Extend your abilities with a remote Mac mini. Save countless hours by leaving the hardware setup, upgrades and support to our trained engineers! With unlimited internet usage, 24x7 remote hands support and guaranteed uptime, a Mac mini from MacStadium is the perfect solution for your Mac compute needs. The new Mac mini has arrived at MacStadium! Yes, you are getting access to a real, dedicated Mac when you work with us. Genuine Apple machines allow you to run macOS or any other OS. 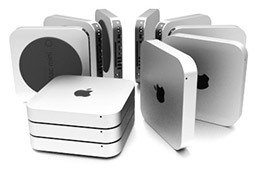 Set up your Mac mini or Pro as a build server and send jobs to and from your local machine. Develop locally while the remote server builds a new version of the app, tests it, and sends it back to your local machine. Our U.S. and European data centers employ a wide-range of advanced security measures, redundant cooling systems, redundant power systems such as enterprise-class UPSs and fail-safe generators. Subscribe to a dedicated Mac mini or Mac Pro running macOS with instant activation and get access immediately – part of our combined infrastructure and software technology. Get direct access to expert engineers with experience in hosting, virtualization, storage and more. Data center technicians are standing by for subscription troubleshooting, changes, or upgrades/downgrades. Start with an individual Mac and only pay for what you need right now. As your needs grow, you can easily change, grow, and customize your solution. Unmetered bandwidth. Network traffic is not throttled or groomed in any way. Expect full download/upload speeds at the network port. Your Mac is always online and available with a dedicated IPv4 address. Apple’s latest macOS is here. Over a dozen of the most popular operating systems and hypervisors available for installation at signup or via support ticket (macOS, linux, Windows, and VMware ESXi). Running VMware ESXi on a dedicated Mac allows you to virtualize macOS/OS X, Windows, and Linux on the same hardware. Access apps on every platform, all from one device that only you control. Every day, organizations including The Home Depot, GitHub, Spotify, King, SurveyMonkey, Ikea, NBA, Hertz, Costco, Basecamp, Honeywell, MIT, Quora, NYU, Day One, Sprinklr, JFrog, Readdle, Rainforest QA, and more use Mac minis at MacStadium for their Mac development needs. Click here for a Mac mini trial and see how easy it is to get started! In addition to our Mac minis, we offer Mac Pro servers in each of our data centers. We’ve designed a patented, custom-manufactured chassis and sled system that fits a pair of Mac Pro servers in a standard rack while providing for easy access. This design also allows us to secure private cloud environments in locked rack and cage units for security-conscious customers to know their data is secure. 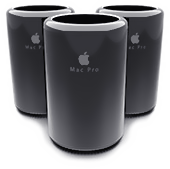 Want to learn more about our Mac Pros? Click here. Get that mini out from under your desk.